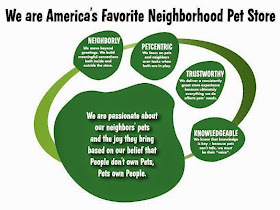 Extra great service from staff, they know their stuff when it comes to pets! I am pleasantly impressed with how consistently their customer service is on point. On this visit I was concerned about my li’l guy, Jaxson. His normal food brand had recently had a recall on one of its other products, so naturally I was hesitant to continue using the product. I discussed with an employee (David) who began asking me questions about Jaxson. Does he seem itchy, does he cough some, are his teeth beginning to have more plaque build up? Yes! Yes! Yes! Instantly he suggested it was the corn in his diet. He suggested a comparable priced alternative with a guarantee that I could return it if Jaxson seemed displeased or symptoms remained. He didn’t immediately suggest the highest priced item – although it was a option. I was impressed that he chose options within the same price range we were previously buying, more in the mid-range prices. He explained the differences in the foods from expensive to inexpensive. I would recommend this store and its staff to everyone! We are very lucky to have this store, its top notch employees. Job most well done, guys! This is just a portion the review Nella posted on Yelp, which can be found here.